There is no doubt that contact lists are the most important part of our iPhones and what we care most about backing up. You may want to be sure the address book is being backed up so that all of your contacts are preserved in case you need to restore them. Then, what is the best way to backup contacts from iPhone? Well, you're now looking at the right article. In this page, we will going to show you top 3 ways to backup contacts on your iPhone with iTunes, iCloud amd Gmail. Learn the instructions one by one now. 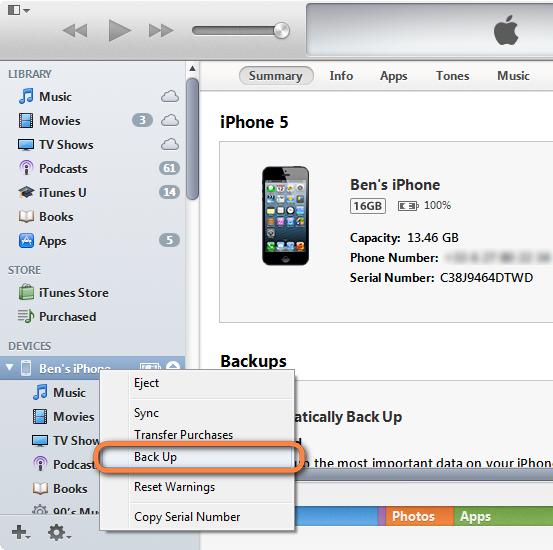 iTunes will backup the contacts from an iPhone by default unless you have disabled it. It is a good thing to remember that backing up your contacts will be a very good way of making sure that your contacts are safe in the event that anything happens to your phone. Here are steps to walk you through the backup process. Step 1. Connect your iPhone to your computer. Step 2. Open the iTunes application on your computer. Step 3. Find and select your iPhone device from the left column in iTunes. Step 4. Right click on the name of the iPhone in the list of devices then select Back Up. This will finally conduct the manual backup of your contacts and save the contacts to the local computer. The backup process is much faster; It does not require an internet connection. It requires computer running; It utilizes HDD space. Step 1. Launch "Settings" and tap on "iCloud". Step 2.Verify the iCloud account is set up and that "Contacts" is turned ON. Step 3. Scroll down and tap on "Storage & Backup". Step 4.Tap "Back Up Now". Your contacts will still be safe even if your iPhone or computer gets a hitch; Your contacts are backed up automatically. It eats on your home internet bandwidth; It requires plugging for it to be automatic. If you already have a Gmail account and use it regularly to send email, then you can also use it as a "just in case" backup for your contacts list. Many people believe incorrectly that only Android phones can take advantage of a Gmail contact backup, since Google and Apple are competitors. However, if you want to backup your iPhone contacts to Gmail, simply use the steps below to do so. Step 1. Go into "Settings" and scroll down to "Mail, Contacts, Calendars." Tap "Add Account" and you will get a visual list of the various email clients to which you can link your phone. Tap the Google tab. Step 2. Enter your Gmail account details in the spaces provided (email, username and password) and tap Next. Step 3. Select Cancel in the dialog box displayed with the error "Unable to Verify Certificate". Remember that this it is not an error; it is part of the process. You will return to the Microsoft Exchange page then enter into the server box m.google.com and select Next. The iPhone will have automatically verified the connection established with your account. Step 4. To complete this, slide your contacts switch to indicate ON then tap on the Done button. Your phone can also deliver a dialog box in which you should select Keep on My iPhone so that your preexisting contacts do not get overwritten. It is cross-platform, which enables one to 'pull out' the contacts to any Smartphone connected to the internet; It is fast, easy and straightforward. It requires that one signs with Google+ or by use of some third party so as to save with it. Editor's Note: Lost all contacts on your iPhone? That's really a nightmare, but you don't need to be panic. Generally, as long as you have your contacts backed up to iTunes, iCloud or Gmail, you will be able to salvage them easily. While, recovering iPhone data via iTunes or iCloud backup always exist some limits. 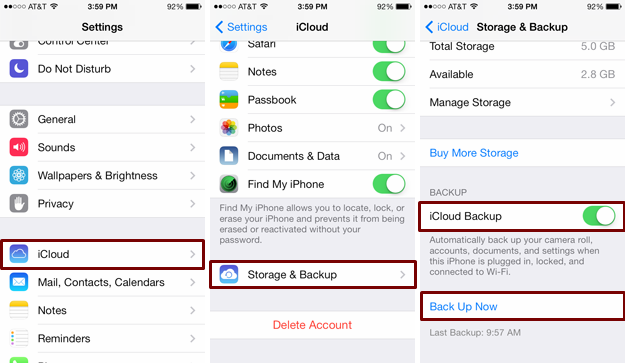 Backing up contacts on iPhone with iTunes and iCloud sounds great, but you never can view your contacts unless you plan to restore your iPhone with the iTunes or iCloud backup you made, and you never can decide what to backup or not. Therefore, here we'd like to introduce you a powerful iOS data management tool - iRefone for Mac, which allows you to selectively back up iPhone contacts to computer for backup so that you can get them back to your iPhone again when necessary. This iPhone contacts recovery program is an easy-to-use data recovery to recover deleted or lost data whatever the reasons and whatever iOS device you're on. With it, you can recover deleted or lost contacts from iPhone even without any backup. During recovery, it allows you to selectively scan & preview, and recover only deleted contacts. Besides contacts, iRefone also can help you retrieve text messages, call history, photos, notes, as well as calendars and voice memos, etc. It supports all the models of iPhone, including the latest iPhone 6S or iPhone 6S Plus. For Windows users, please turn to iRefone.